Faculty, staff and students are encouraged to participate in the upcoming blood drive happening on campus. 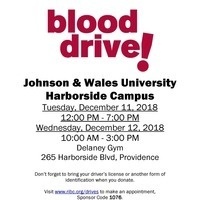 Don't forget to bring your driver’s license or another form of identification when you donate. Make an appointment using sponsor code 1076. Walks in ALWAYS welcome!